These forms are normally issued in early April to people who need to complete a tax return, but do not require the paper tax return form. I have been hearing reports from clients that there seems to have been a delay in issuing the forms this year, indeed my own notice only arrived today – 6.5 weeks after the issue date on the form. As we have already completed the 2013 tax returns for several clients these forms are arriving after the return has been submitted and are causing confusion. I would expect that the forms are all printed in bulk in advance of being sent out, and as such won’t have been adjusted for any tax returns that have been submitted in the meantime. This is an important point – some people may not realise that the penalties for not submitting the return apply to the actual return, not whether there is any tax liability as used to be the case. 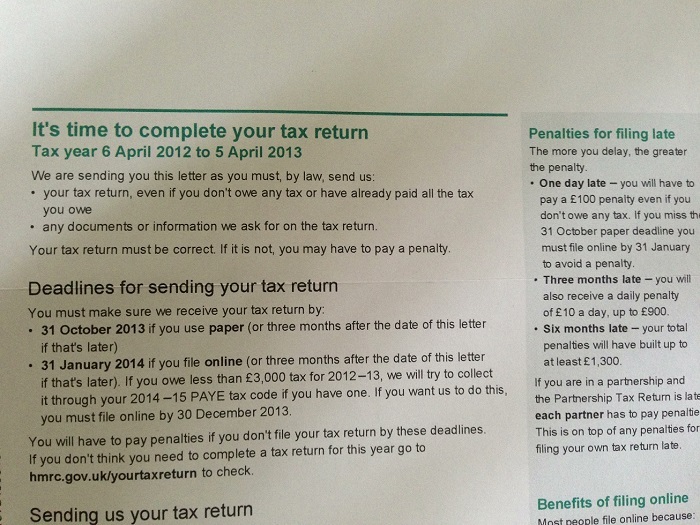 Indeed, HMRC have even fined people who are due a repayment of tax but were delayed in submitting the form to them. The form also states the penalties that apply for late returns, including the daily penalties which are regularly applied now. If you know anyone who has received one of these notices, and requires assistance with their return, please do put them in touch – I offer a no-charge initial meeting where we can discuss the opportunities.